For the third year in a row, Austin tops the annual report conducted by U.S. News. Every year, this in-depth report analyzes several factors, such as quality of life, the job market and housing affordability. An overall score of 7.6 punched Austin's ticket for this prestigious honor. Net migration and Desirability were among Austin's highest scores, with Quality of Life and Job Market also placing well. In looking at the overall report, Austin was amongst the nation's worst with regards to transit. Other nearby cities also were in the top 50, with Dallas-Fort Worth ranking 21st, Houston at 30th and San Antonio at 34. What factors contribute to your happiness? In a study recently done by Wallethub, Austin ranked #14 on list of happiest cities in America! Especially with the nice weather approaching, it’s easy to be happy in Austin. There are so many opportunities, activities, and places to experience. For years, researchers have studied the science of happiness and found that its key ingredients include a positive mental state, healthy body, strong social connections, job satisfaction and financial well-being. However, money can only make you so happy – people who make $75,000 a year won’t get any higher satisfaction from more money. According to a study done by CBRE Austin ranks #3 on list of markets emerging in the life sciences industry next hot spots. The life sciences revolution is occurring at a rapid pace. Ranked on the basis of recent life sciences employment growth, number and concentration of key scientists, NIH funding, quality and quantity of educational institutions providing life science graduates and medical research and health services institutions, and number and concentration of high-tech workers. Right now, the areas leading the nations life sciences clusters. Being successful doesn’t come easy. You must work hard to see the results you want. Unless you win the lottery, you’ll never be successful being lazy. Austin ranked one of the hardest working cities in America according to a study done by WalletHub. Americans on average put 1,780 hours per year- that’s 70 hours more than Japan, 266 more than the U.K. and 424 more hours and Germany. The methodology used in determining the hardest working cities was based on a few factors; Average workweek hours, employment rate, share of workers leaving vacation time unused, average commute time, average leisure time, and share of workers with multiple jobs. Interesting enough, the cities ranked the highest had some of the US’s best economies. Are you and a special someone looking to get away for a romantic getaway? Austin was recently listed as the 4th most romantic city in North America. When looking for a vacation spot people have many different needs. Lucky for you, Austin has a lot to offer, making it an ideal place for everyone. Austin Named the Best State Capital to Live in! 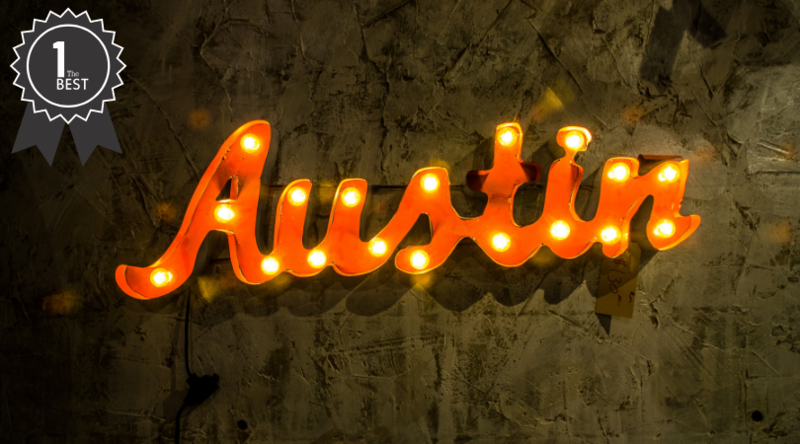 Austin is named the best state capital to live in according to a study done by WalletHub! Austin was at the top of the charts on all four methods. Ranked 12th in affordability, ranked 1st in economic well-being, 4th in quality of Education and Health, lastly, ranked 4th in quality of life. 17 of the US capitals are the largest cities in their state, unlike Austin. Some capitals have rampant poverty problems. For example, over 30 percent of the population of Harford, CT lives in poverty, compared to 12.7% of the entire United States. Austin Ranks #1 as The Smartest City by AT&T! Internet: Austin’s internet connectivity is off the charts. It ranks first in percentage of population with access to broadband internet (76% overall) and is in the top five for percentage of the population owning a computing device (96%). Apple took note of Austin’s connectivity efforts, and announced Austin as the location for its new campus. Another large internet boost for Austin is Google Fiber. Fiber is one of the fastest internet services and Austin was named one of the cities to host the test trial. Austin tops Milken Institute's annual ranking of best-performing cities. We all know that Austin is growing. Tech industry is BOOMING and Austin has been doing their best to keep up with the influx of people. There is not only a lot of job opportunities, but also amazing unique experiences. Restaurants and hotels are popping up left and right making it not only a great city to live but also a great place to visit. Companies like Google, Apple, Amazon, HEB, and many more are creating a sustainable AND enjoyable economy. Austin’s growth has been something to watch over the last decade with the population sitting right under 2 million people. Not only are people moving here, they are staying here. Don’t you wish you were ahead of the real estate game? Southeast Austin makes Trulia's list of hottest neighborhoods taking off in 2019! Southeast Austin has ample space and land for large communities. The best part about SE Austin is that its very close to downtown! The study was conducted by looking at the year-over-year change in home values, median days on market, and the change in days on market since the previous year. Have you ever heard of the phrase “FOMO”? If you have been hanging out with the millennial crowd, then you probably heard the phrase thrown around. If you haven’t heard this word before you might be surprised that it actually stands for something! Expedia recently released a list of the top 14 most FOMO worthy cities. Austin is One of the Healthiest Cities in America! Location matters when it comes to health. Some places promote wellness by expanding access to nutritious food and recreational facilities. Others strive to keep healthcare costs affordable for everyone or keep parks clean and well-maintained. When a city doesn’t take care of these issues, it can be hard to keep up good health. Lucky for Austinites, these issues are taken care of. In a recent study done by WalletHub, Austin ranked #14 on list of healthiest cities in America! Are you single and ready to mingle? Dating at any age can be incredibly intimidating. If you are single and live in Austin, you’re starting in the right place. In a recent study done by Apartment List, Austin ranked #1 for the best city for dating. Austin is thriving in all ways of the matter. Large job and population growth that brings in new eligible singles every day! The data shows that there are better dating opportunities for singles with higher levels of education. Thanks to some new developments and corporations, Austin is filled with not only singles, but SMART singles. There is nothing better than connecting with someone through high level conversation. Overall, 32.5% of college-educated singles were satisfied with dating opportunities, while only 25.3% of non-college-educated singles were satisfied. Finding like minded people can boost your own happiness. Austin Ranked #2 on a List of the 10 Fastest Growing Airports in the U.S. In a study done by Upgraded Points Austin ranked #2 on a list of the 10 Fastest Growing Airports in the U.S. With a growth rate of +62.92%, Austin Bergstrom International Airport is growing, but still not enough! Even though the Airport is growing at the second largest pace, it most likely will still not be able to keep up with the ever-growing population. The study was done based off the information and statistics between 2007-2017. As we know, Austin has been growing in population at crazy levels so it’s not surprising that AUS had to keep up by building new gates and new security. If you have been in the Austin airport recently, I’m sure you’ve noticed the growth in restaurants, security stations, and terminals. Unique fact about AUS is that all the restaurants there are Austin based!! Do you work in STEM cell research? If not, you might actually consider going back to school for a few years- According to the latest U.S. Bureau of Labor Statistics analysis, STEM — science, technology, engineering and math — professions grew at over twice the rate that non-STEM jobs did between 2009 and 2015. Most types of STEM jobs will also expand faster than all other occupations until 2024. In a recent study done by Wallet Hub, Austin was ranked #4 on a list of the best cities for Stem Jobs. Mike Bloomberg recently named Austin as a winner in Bloomberg American Cities Climate Challenge. The Climate Challenge is designed to deliver on America’s Pledge and help keep the United States in the Paris Agreement. Austin, among other cities, was chosen as winners in a two-year acceleration program that will provide powerful new resources and access to cutting-edge support to help meet or beat their near term carbon reduction goals. The American Cities Climate Challenge is a $70 million dollar program designed to catalyze efforts to reduce climate change and keep the U.S. in the Paris Agreement. Ever feel like you need a vacation from your vacation? Going on trips is fun filled with experiences, food, travel and more. Unfortunately, this usually leaves you feeling even more tired than before you left. Want to go somewhere that will make you feel more relaxed? In a study done by Remedy Review Austin ranked #16 on list of the most relaxing cities for a vacation! Most people vacation in Austin for the music. SXSW and ACL bring in thousands of people every year. Austin is known for its music scene but staying up all night rocking out can be exhausting. If you really want to lay low and recharge AND hear some great music, come to Blues on the Green at Zilker Park over the summer. Blues on the Green is a free concert series over the summer where you can lay in the park and watch the sunset while listening to bands play. Who doesn’t love beer, food, and fun? In a study done by Vine Pair, Austin Ranked #1 on List of The World’s Top 10 Beer Destinations for 2019. Austin & Round Rock are among the 20 Fastest Growing Cities in America and Austin is the fastest growing large city in ranking based on 15 demographic and economic measures. BBQ, games, slip n slides, and sunshine are key components to a great block party. In a study done by Best Places, Austin was ranked #1 on a list of Best Block Party Places! Austin has amazing surrounding suburbs. Lake Travis, Travis Country, Manor, Westlake, Cedar Park, Pflugerville, and many more are some of the top suburbs not just in Austin, but in the whole state. There are a few things to consider when throwing a block party, but the most important thing is safety. You will be having a party on a street and so you want to put up slow signs and keep an eye out on the roads. Children will be running around, and most likely alcohol will be consumed by the parents. Nearly three in four Americans believe that the country should do whatever it takes to protect the environment. Living “green” means choosing to engage in in cleaner, more sustainable habits in order to preserve the planet as much as possible. In order to determine the greenest cities in America, WalletHub compared the 100 most populated cities across four key dimensions: 1) Environment, 2) Transportation, 3) Energy Sources and 4) Lifestyle & Policy. Austin is far ahead of the times, rolling out effective alternative transportation methods like electric scooters and bikes. It seems like the majority of Austin is always on the go. With companies like Lime, Bird, Uber, and Lyft releasing new scooters or bikes every month, it’s nearly harder to drive yourself. Preserving places like Zilker Park and Barton Springs is another factor. These beautiful places are packed and well taken care of during the warmer weather.